The amount of meat my boys go through is absolutely insane. The other night, my husband brought home this epic T-bone steak and I thought to myself, “Oh, good! We’ll have leftovers.” I’ll make wraps… some kind of steak salad… maybe stroganoff… (when’s the last time you had stroganoff?!). But the three of them devoured it like a pack of wolves! I heard ravenous snarls coming from the table. On the other hand, I wasn’t in the mood to partake in this carnivorous feast. I threw together a quick pasta dish with some random bits and pieces from the fridge. And it began with leftover rotini. You know I’m very particular about my pasta shapes, right? It’s like picking out a paint color. I like rotini because the ingredients, sauce and cheese fall into the playful coils creating the perfect bite- I love that. For this dish, I quickly sautéed some frozen pancetta with sliced leeks and zucchini. I threw in some plain cooked pasta, a splash of homemade chicken stock and parmesan cheese to create a light sauce. Right before it was ready, a handful of fresh peas went into the mix. I usually cook with frozen peas. They’re tasty and easy to find. But every spring, the fresh ones pop up for a brief moment and they’re definitely worth grabbing. And to keep things light, I half the amount of pasta and double the vegetables. How do you co-exist in the kitchen with your loved ones? 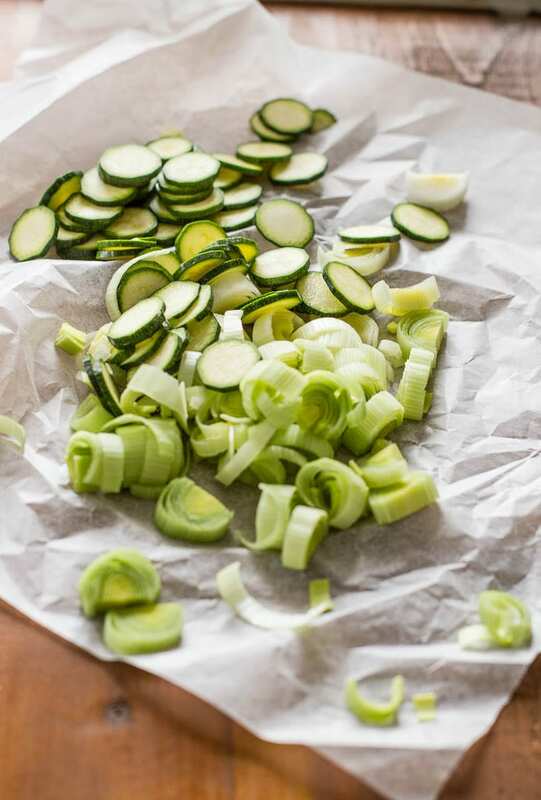 I used baby zucchini for this pasta but regular zucchini will work too- cut them into half moon shapes. No rotini? No problem! Try ditalini, small shells and orecchiette instead. *1 cup of dry, uncooked pasta yields about 2 cups cooked pasta. If you're using dry pasta, go ahead and prepare it according to the package instructions. Drain and set aside. In a large skillet warm the olive oil over medium heat. Add the pancetta and sauté until lightly golden, about 3-5 minutes. Throw in the leeks and cook until they start to soften, about 3 minutes. Add the zucchini and continue to cook for another 3 minutes or so. Season with salt and pepper. Now add your pasta to the pan. Pour in the chicken stock, butter, and a good handful of parmesan cheese. Stir well until the liquid starts to thicken. Add the peas. To serve, pile the pasta onto a giant platter or into a nice serving bowl. Garnish with extra parmesan on the side. 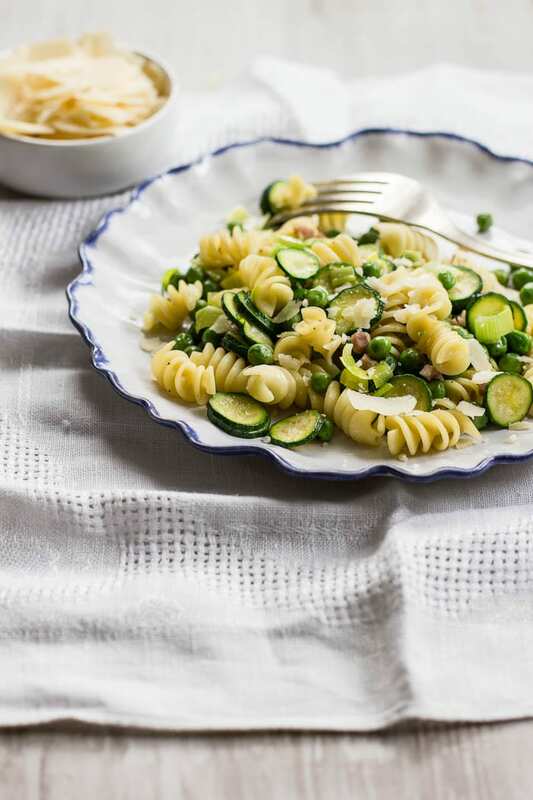 i love seeing all the spring pasta dishes going around! i love a big hearty bowl of pasta, but i love pasta and green vegetables equally and it’s such a welcome change right now. gotta go get some fresh peas!! 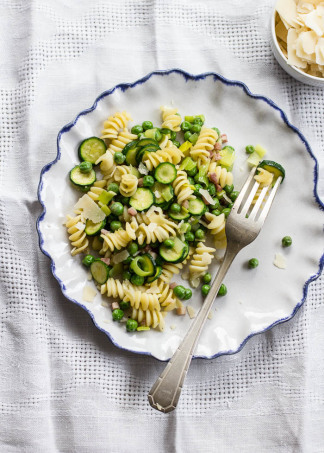 This is such a pretty pasta for spring! And yes, it’s astonishing how much meat men can put away! Thank you! And yes, tell me about it. And my boys are little… wait until they grow up! Oh my, the way you describe rotini is so perfect! I never considered WHY I loved rotini, but you lay it out so perfectly. Gorgeous spring pasta <3. Haha.. this made me laugh. I was telling my mom about your comment and we both agreed- as you’ve mentioned, we’re naturally attracted to certain pasta shapes but it’s really hard to describe why. In addition to rotini, I love small shells, pastina and mini penne- they remind me of my childhood. What a beautiful pasta recipe! I love this pasta Emilie! The leeks, veggies and simple sauce. The freshness and flavor sound so inviting and is making me crave pasta with peas!! I just found a bag in my freezer! Thank you for this! Have a lovely weekend, Emilie! 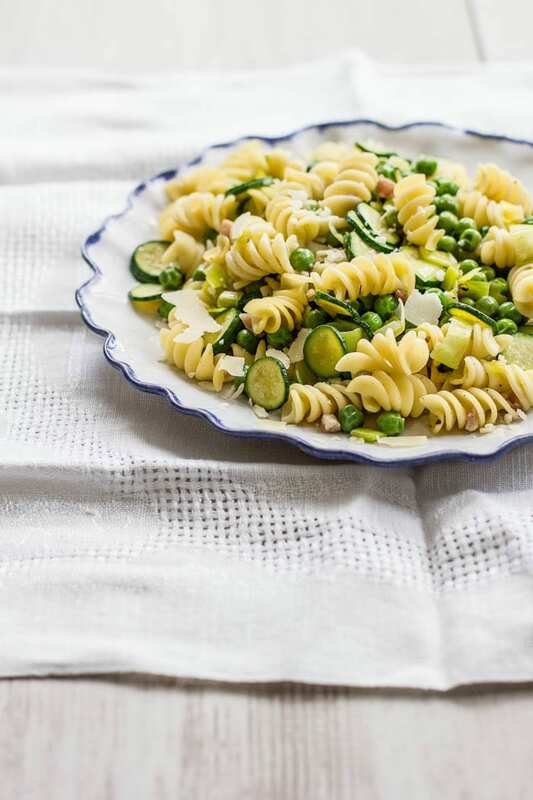 Simple spring pasta dishes are the best! Love the look and sound of this one. We still have to wait for fresh, local peas up here in the north (like at least till late May/early June! ), but I’m sure this would work with frozen peas as well. Hi, Emilie! Found your blog through Saveur shortlist and you totally got me. So many amazing recipes, real food, beautiful pics and such a nice text! :-) You have one more fan! Keep the great job! Love from Brazil! 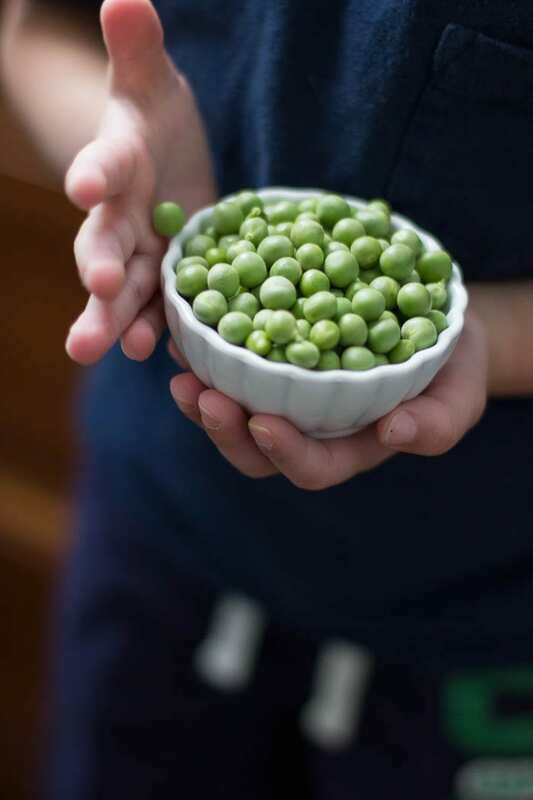 Those fresh peas look so big and delicious! Pam, they’re absolutely delicious. So fresh and have a great bite to them! 1. I voted for you! congrats, and yay! 2. half the pasta – double the veg. I wrote this down. It’s genius. 3. mini-zucchini, nothing could be cuter. I make stuff like this in a pinch or for comfort – i always add a squeeze of lemon, too! Francesca! THANK YOU SO MUCH. You are awesome. Yes- the pasta trick is amazing. I do it all the time and I promise no one suspects a thing. And I found the mini zucchini at the market recently. They are sweet and not very watery, which is nice. But they cook fast! I hope you can find some, although regular zucchini will work out just fine too. A gorgeous, fresh dish. I love this. My husband is a carnivore, and I ma not, but we have made it work. We have a deal though, if he wants to eat ribs or chicken wings, I go in the other room :) And if I want to spiralize all veggies and use them as pasta, I am on my own. It is working out great! Made this for dinner last night and thoroughly enjoyed the flavors. I added a pinch of red pepper flakes, will definitely make again and so easy to make when you get home from work. I’ve been looking through your recipes since I happened upon your sourdough post (I’m growing my first starter!) and your photos are recipes all look so delicious. I can’t wait to try them.